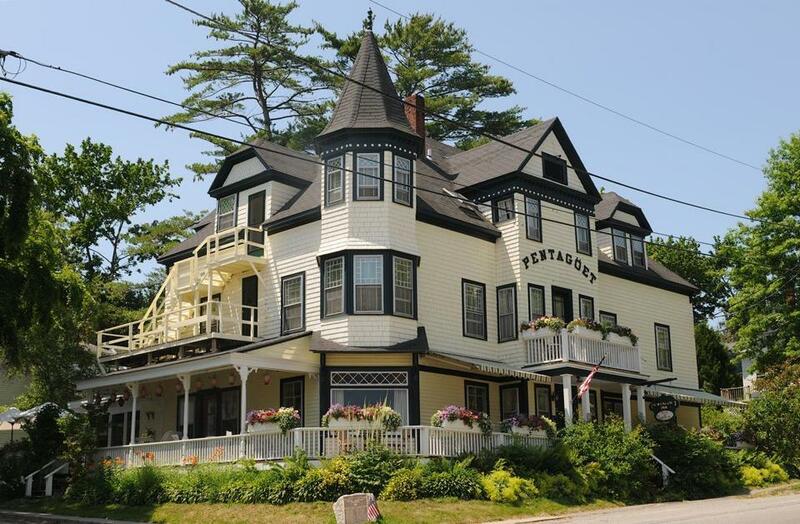 The Pentagoet Inn features a three-story, Queen Anne Victorian and an adjoining Federal. Like history? You’ll love Castine, a serene New England village tipping a cape reaching into Penobscot Bay at the mouth of the Penobscot River. Fought over for 200 years by Britain, France, and the Netherlands, it was the site of the Revolutionary War’s Penobscot Expedition, which has been called the worst American naval disaster before Pearl Harbor. The village, now home to Maine Maritime Academy, is peppered with fort ruins and historic sites, along with an enviable collection of Georgian and Federalist architecture. $275). Once the summer “cottage” of Arthur Fuller, a South Boston Yacht Club commodore, it allows pets ($25 per pet per stay). Especially popular with families, Castine Cottages (33 Snapp’s Way, 207-326-8003, www.castinecottages.com) rents two-bedroom, water-view housekeeping cottages for $725 per week. The Guildive departs from Dennett’s Wharf for day cruises on Penobscot Bay. wharf.net, $10-$25) is a colorful barn of a place with an outside deck offering front-row seats on the harbor. Enjoy cocktails or dinner in the candle-lighted dining room, cozy Passports Pub, or on the big wraparound porch at the Pentagoet Inn, where the menu ranges from bistro plates to full entrees ($18-$29). Dennett’s Wharf’s deck offers front-row seats on the harbor. 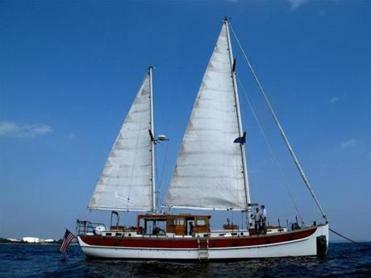 .guildivecruises.com, from $40), captained by Kate Kana and Zander Parker, departs from Dennett’s Wharf for day cruises on Penobscot Bay. 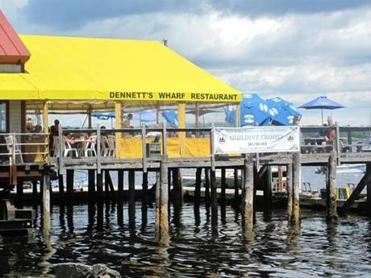 Dennett’s Wharf often has live music, ranging from folk to rhythm and blues, as does Danny Murphy’s Pub (207-326-1004), tucked underneath the bank facing the parking area and the harbor, where you might hear anything from rock to acoustic Celtic. Try Stella’s Jazz Nocturnal (26 Water St., 207-326-9710) for the best in live jazz in the area. In the mood for something more contemplative? Join Castine Kayak (see above) on a Bioluminescent Night Paddle ($55), to view glow-in-the-dark phytoplankton in the water and the constellations in the sky. Hilary Nangle can be reached at www.mainetravelmaven.com.